This is primarily a DIY recipe that comes to the rescue of people who think salad is boring and/or can’t be bothered to cook. You will need to stretch yourself to make a Basic French Dressing and maybe boil some eggs (only if they take your fancy), but the final eating experience will far surpass your expectations of wading your way through a plateful of bog-standard salad. Not only are these Lucky-Dip Salad Jars as pretty as a picture (thank you Sarah at Mirror Imaging), conveniently portion controlled (no fighting over a communal salad bowl for the best bits), fun to eat and packed with nutrients - their airtight seals means they can be assembled up to 24 hours ahead and everything will stay just as fresh and perky as it was when first prepared. The key to success is layering a ‘rainbow’ of different, complementary salad ingredients that are shredded or very finely sliced (use a mandolin, if you have one), so that every forkful is a delightfully surprising, light and easy-to-eat, flavour fest. Ideally packaged for picnics, for taking to the office or when you’re working away from home - I conjured up these Lucky-Dip Salad Jars in anticipation of a long-distance photographic assignment that involved an overnight stay, which would have prevented Sarah and I from eating ‘right’ (low-carb, organic, real food), for more than 24 hours. However, don’t save these perfectly balanced, perfectly dressed, ready-to-go salad jars just for on-the-hoof dining. They’re much too good for that. I now regularly bring them to the table whenever I want to add more plant-based nutritional oomph, colour and interest to everyday family meals. You can either let your imagination run riot and buy a variety of fresh, salad ingredients to make these Lucky-Dip Salad Jars from scratch, or else ferret around in the bottom of your fridge for inspiration. It doesn’t take too much in the way of vegetables, herbs, salad leaves and other tasty tidbits to fill a 700ml Kilner jar with good-for-you things in contrasting colours, flavours and textures. Filling the Kilner jars is more like flower arranging than cooking. Simply take your time to neatly layer your chosen ingredients roughly in the order I’ve listed below and these bright and beautiful Lucky-Dip Salad Jars speak for themselves. You’ll discover a ’lucky-dip’ each time you dive deep into your personal salad jar because every forkful you randomly skewer is a different combination of ingredients and flavours. It’s such a novel and moreish way to eat salad, even I don’t remember what I’ve loaded my jars with until I start eating one! What I do know is that these Lucky-Dip Salad Jars are a convenience food that has all of the pleasure and none of the pain it takes to feed yourself healthy. You’ll need a 700-750ml, sterilised, clip-top, wide-mouthed, Kilner jar for each person - see Notes below. Make a Basic French Dressing (see recipe below) before you start preparing the rest of your ingredients. Select your ingredients from the suggestions listed and, if at all possible, buy organic to avoid eating chemical residues along with your salad! Let your imagination be the limit of these Lucky-Dip Salad Jars rather than the ingredients I’ve put forward for consideration, which could have gone on ad infinitum! Okay, maybe I can’t resist a few more…hummus, orange/grapefruit segments, sweet peppers, red or white chicory, very finely sliced raw cabbage, toasted seeds (sunflower, flax, pumpkin), smoked mackerel, smoked salmon, sardines, prawns, blanched asparagus, cucumber etc. etc. The approximate amounts given alongside each ingredient are per salad jar, but much depends on how many different ingredients you’ve chosen to use. If you’re using several ingredients of a similar type e.g. grated raw carrots and grated raw beetroot, you’ll probably need to scale back the amounts of each to 50 grams to make a 100 grams in total. Layer your prepared salad ingredients in roughly the order I’ve given below. They’re organised like this for a reason - for example, grated purple beetroot would need to go into the bottom of the jar first so it doesn’t ‘bleed’ into the rest of your ingredients and delicate leafy greens go into the jar last so they don’t get squashed, bruised or soggy. Put all the ingredients into a screw-topped jar and shake vigorously. 10g Sprouting seeds of your choice - broccoli, clover, mustard, radish, onion, alfalfa etc. 1 tbsp Finely chopped herbs - coriander, mint, dill, parsley, chives etc. Place 1 tbsp of dressing in the bottom of each jar. Start layering up your selected ingredients roughly in the order listed above. Seal the lid on tight and refrigerate. When you’re ready to eat, drizzle another 1 tablespoon of dressing on top of the salad, re-seal the jar then tip upside down and shake well. Dive in with a fork to enjoy! I subsequently discovered the seemingly best-shaped 700ml Tala jars that feature in this blog post were not dishwasher proof, as described on Amazon’s website. You need to make sure that the clips that secure your Kilner jars are stainless steel; the Tala ones corroded and went rusty after just one round in the dishwasher! 450-500ml Kilner jars would be a better size for children and would still have sufficient space to layer a variety of ingredients that hopefully they’ll want to eat. As far as possible, when selecting your salad ingredients make the most of each season’s fruits and vegetables and buy organic. This makes sense because it provides your body with what it needs nutritionally at different times of the year. There’s a bit of guesswork involved in the total amount of ingredients you need to use to fill the jars attractively. Having decided on what ingredients I’m going to use to assemble my jars, I usually eyeball the quantities of each item I need to prep (chop, finely shred, grate etc. ), before separately weighing and layering that particular ingredient equally between the number of jars I’m filling. I then prepare, weigh and continue to layer-up the rest of the ingredient in the same way until the jars are full. Don’t forget to take a fork and a small, tightly-sealed glass jar of Basic French Dressing with you if you intend eating while you’re out and about. Today’s blog post is for a complete summer meal that’s easy to prepare when you have a lot on your plate. Including whizzing together a batch of Macadamia Oil Mayo (I always keep a jar of this at-the-ready in my fridge), everything can be brought together in less than half an hour. It’s healthy, its quick, it’s delish! This year, when the first Jersey Royal potatoes came into season, I couldn’t resist making a real potato salad (cold, pre-cooked potatoes are an excellent source of resistant starch) and it actually took me longer to scrape the papery skins off the potatoes than it takes to make this entire meal! Henceforth, I shall live without pesky potatoes! It’s the labour intensive ‘potato-peeling’ type of cooking chore that’s been fully exploited by food corporations and made their marketing hype so successful. They’ve convinced society that ’fast’ food and ready meals are quicker, cheaper and easier to get on the table. However, I disagree. You can make Grilled Mackerel with Creamy Keto ‘Potato’ Salad & Watercress in less time than it takes to order a takeaway and have it delivered. It’s probably cheaper too. And obviously, better for your health. Actually, food corporations don’t cook; they process deadly ingredients sourced from the cheapest, most consistently available form of food, namely genetically engineered crops, grown with toxic chemicals. Do you really believe pesticide laden, genetically engineered, processed food - food that could never be created by nature - isn’t disastrous for human health? Whilst most people crave these edible abominations and see them as desirable ‘convenience’ foods, I can’t think of many things more inconvenient than being dependant on fake food contaminated with toxic chemicals. Processed food is chock-full of refined sugar, chemically altered fats, refined carbohydrates and other processed ingredients poisonous to humans that are a root cause of many food-related diseases including obesity, diabetes, heart disease, cancer and Alzheimer’s. It’s not just biotech giants, industrial farming, food corporations and other toxic chemical food polluters that assault your body. Doctors have been delivering terrible advice for decades. Instead of focusing on the prevention and reversal of obesity and disease by tackling its underlying cause, which is eating modern foods incompatible with our genes, doctors respond to the body’s cries for help by intervening with drugs or surgery to suppress symptoms. Why the medical establishment hasn’t been sued for actually causing bodily harm beats me! Of course, they are reluctant to admit their mistake, so it could be a very long time before doctors get behind public health advice telling its citizens to return to eating the natural, unprocessed food that was consumed before obesity and diabetes reached epidemic proportions. The fact that the apple doesn’t fall far from the tree was highlighted in a recent BBC1 programme called The Big Crash Diet Experiment. The ‘experiment’ presented itself as an hitherto unknown (at least to doctors), revolutionary treatment for the obesity and diabetes crisis and, if you believe everything you see on TV, the spectacularly successful results really took the doctors by surprise. After all, who knew that a very low calorie diet triggers ketosis, which accelerates weight loss, lowers blood sugar levels and reverses the symptoms of diabetes? Awww, c’mon guys! That would just be me and an entire Primal Health community then! But still they can’t help themselves. In sharp contrast to the natural, LCHF (ketogenic) whole food diet promoted by Primal Plate, the doctors’ solution was to by-pass any requirement for cooking skills and feed four grossly overweight volunteers highly processed, low-calorie, meal replacement products (a.k.a. The Cambridge Diet)…naturally, under strict medical supervision! They then pronounced themselves the successful innovators of a drug-free advance in modern medicine that could save the NHS millions of pounds. Stop right there! I have never seen a more miserable group of people than the programme’s volunteers, who were made to suffer deprivation and hunger in a ludicrous attempt to limit calorie intake by eating synthetic packaged meal replacements soups and shakes cobbled together in a science lab. This is not my idea of healthcare, nor is it sustainable. However, if your long-term goal is to get fat and sick, go for it! Last time I looked, products like SlimFast are loaded with chemical thickeners, sugar, artificial sweeteners (e.g. aspartame, maltodextrin and ace-sulfame K), inflammatory vegetable oils (soy and sunflower), carageenan (linked to cancer of the gut), modified maize and soy proteins (genetically modified) and cheap vitamins that are poorly absorbed. Here’s a piece of ancestral wisdom based on your genes and human evolution: Cooking nutritionally dense food is where it’s at! If you want to eat well, lose weight and feel great for the rest of your life, you’re going to have to reclaim control over what you’re eating, which means prioritising some time to cooking real, fresh foods. So why has home cooking got such a bad rap since the 1970’s? Because clever advertising duped people into believing that cooking is too hard, too complicated and too time consuming. You can see its effect in society at large (pun intended), there’s an obvious correlation between a preference for eating high carbohydrate, processed food and increasing rates of obesity and chronic diseases. Notwithstanding the profits-before-people economy at the heart of agriculture, restaurants and fast food industries, we recently decided to eat out and were reminded just how unsatisfying and expensive it can be. In exchange for some promotional photos she’d supplied to a local restaurant, Sarah had been given a £50 voucher that had to be redeemed before the end of June 2018, so it was simply a case of use it or lose it. We each selected a main course off the Early Bird menu, took our Üllo wine purifier to filter our non-organic wine at the table, decided not to negotiate the chorizo part of the dish for something more to our taste, and came home hungry! Total ‘early bird’ price £72.50 + gratuity. That doesn’t seem like good value to me. Let me compare. Fresh, mackerel fillets, rich in anti-inflammatory omega-3 fatty acids, take no longer than 4-5 minutes to cook under a hot grill. Make-ahead, keto ‘potato' salad, can be assembled several hours before you want to eat it and takes about 15-20 minutes to make, including boiling the eggs and making a batch of mayo. Opening a packet of watercress adds 30 seconds. Finito! Using premium-priced, organic ingredients (you can buy these cheaper at most supermarkets), Grilled Mackerel Fillets with Creamy Keto ‘Potato’ Salad & Watercress, will feed three people, including a good bottle of organic, low sulphite wine for just £24.70 or £8.23 per person. Say what? How can home cooked food be “too expensive” or “too time consuming” when there are literally dozens of healthy, delicious meals that can be prepared within half an hour for less than the £8 or so it costs to buy a single gin and tonic or decent glass of wine at your local? This is even before you factor-in the future cost of disability and ill-health because you neglected to eat right. The question is whether you think the rewards of sourcing fresh, preferably organic food and preparing your entire meal is worth the effort. If you’re willing to invest the time and money you’re going to be a lot healthier. Being taught how to cook nutritious food that supports your body is what true healthcare is about. It’s people that don’t cook that get into trouble with diseased states. Whilst ever public health is stuck in the past and resistant to change, you’ll need to pick a team. Food as medicine is not exactly a revolutionary idea, even to doctors, but you will need to decide whether you’re willing to continue on with the botched up, calamitous, health strategies that allopathic medicine, pharmaceutical companies and food industries have subjugated us all to, or whether to take a more do-it-yourself approach by respecting your hunter gatherer genes and choosing food consistent with your biology. Namely, a higher fat diet that doesn’t include poisonous modern foods such as refined sugar, grains and chemically altered fats and dairy. I’d like to start a cooking rebellion. The only way to safely stop obesity and other diet-related disease in its tracks is to remove people’s addiction for highly processed food and to replace it with more pleasurable alternatives. In the case of food, nothing is more delicious than a nutrient-dense, primally aligned, high-fat, moderate-protein and properly prepared, low-carbohydrate diet. 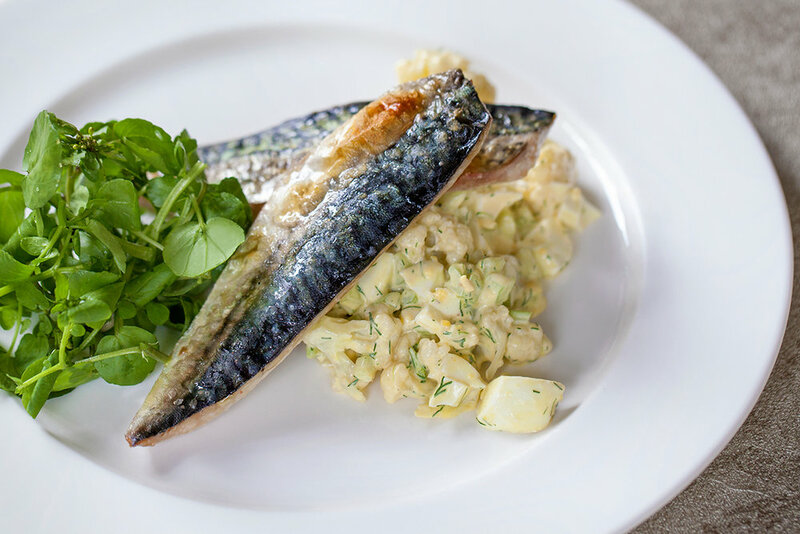 Grilled Mackerel With Creamy Keto ‘Potato’ Salad and Watercress is a good place to start. Boil a kettle of water. Put the boiling water into the bottom of a steamer. Prepare the cauliflower by cutting the head (you don't need any stalk) into small bite-size florets. Place the florets into the steamer basket and steam until the cauliflower is only slightly tender, about 4-6 minutes. Plunge into ice cold water, drain well and set aside. Peel the eggs and reserve two yolks; dice the remainder and set aside. In a large mixing bowl, make the dressing by whisking together the sour cream and mayonnaise. Mash the two reserved egg yolks well with the back of a fork, then add to the cream mixture and whisk together until smooth. Add the cooled cauliflower, diced eggs, celery, and dill to the dressing. Stir to coat. Taste and season with salt and pepper, if you think it needs it. Garnish with chopped chives immediately before serving cold or at room temperature. Line a baking sheet or grill pan with parchment paper or non-stick foil and brush the surface with olive oil. Dry the mackerel fillets with kitchen paper and season the flesh side with salt. Lay the mackerel fillets skin side up on the lined baking tray, brush the skin with olive oil and season with salt. Grill the fillets for 4 minutes, then if the skin is not already golden brown and crispy, switch the grill to its highest setting and cook for a further 1-2 minutes until it is. Serve hot with Creamy Keto ‘Potato’ Salad and a large handful of watercress sprigs. Place all the ingredients into a tall, narrow container. Taste and add a little more lemon/lime juice and seasoning, if liked. N.B. Don’t worry if the mayonnaise seems a little on the runny side when it’s first made. It thickens up to the perfect consistency, when chilled down in a refrigerator. Transfer to a glass container and seal with an airtight lid. Store in a refrigerator and use within 7 days. To steam-boil eggs - boil a kettle of water. Pour about 2.5cm (1 inch) of the boiling water straight from the kettle into a saucepan. Put the lid on the pan and steam/boil the eggs for 10-12 minutes until hard-boiled. When you’re low on time and high on hunger, Smoked Mackerel Tartare is a tasty little number that you can whip up in less than half an hour. Isn’t that just music to your ears? As a retiree - well, at least from lucrative employment - I still find myself racing against the clock to get things done. Quick and easy meals are increasingly becoming the order of the day and I’m guessing that it’s not just me that’s struggling to stay on top of my life situation. Oftentimes, this means that at the end of a busy day I’m frantically searching for last-minute inspiration from my extensive library of cookery books to find those recipes that either meet my criteria for Primal or that can be adjusted to suit. Sometimes I’ll stumble across an “If it ain’t broke don’t fix it” recipe that I can bring straight to the table without any fussy whatsoever. This one is rich in omega-3 fatty acids that reduce inflammation and may help lower risk of chronic diseases such as heart disease, cancer, and arthritis, as well as being virtually carb-free. Perfect for Primal, Paleo and ketogenic diets, all credit goes to Hugh Fearnly-Whittingstall’s book ‘River Cottage Light & Easy’. Call me greedy but I have adjusted the quantities slightly upwards. For a main meal, I think you need to allow 1 mackerel fillet and 1 egg per person. To help keep your omega-3 to omega-6 ratio in balance (see Notes below), I also recommend that you make your own healthy 3-Minute Mayonnaise to bind the ingredients together. C’mon peeps, 3 minutes still makes this recipe do-able within 30 minutes! For a quick and easy, satisfying lunch or supper, Smoked Mackerel Tartare is wonderful. Simply add crisp salad leaves and Paleo friendly, oven-baked ‘bruschetta’ to balance out its fishy virtues. As well as being a fat-for-fuel lunchbox solution to sustain Sarah and I at Mirror Imaging weddings, it also makes yummy, low-carb hand-me-rounds simply piled into hearts of Little Gem lettuce or chicory leaves to serve at picnics and parties. Very moreish and made in minutes, I think you’ll find that this recipe is just too good to pass up. Little Gem lettuce, Vegan Paleo Nut & Seed Bread “bruschetta’, organic radishes. Skin the mackerel and use your fingers to break the fish up into chunky, bite-sized pieces. Put the mackerel into a bowl with the rest of the ingredients and fold everything together very gently so you don’t break up the ingredients too much. Taste the tartare and add a little more black pepper and lemon juice if you think it needs it. N.B. The smoked mackerel usually has enough salt, so you shouldn’t need to add more. Place Little Gem lettuce hearts or other crisp salad leaves on to a serving plate or on to individual plates. Intersperse the salad leaves with thinly sliced radishes (extra pretties and peppery crunch! ), if using. Pile the mackerel tartare on top of the leaves. Sprinkle over the remaining parsley or dill and add another grinding of black pepper, if liked. The best smoked mackerel I’ve found for flavour and texture is Sainsbury’s Taste The Difference smoked mackerel. For this recipe, paying a little extra, really does make a difference! To make Vegan Paleo Nut & Seed Bread ‘bruschetta’, slice the bread very thinly and brush both sides with olive oil. Put the slices of bread on a baking sheet lined with non-stick foil and bake at 200℃ / 400 ℉ / Gas mark 6 for 12-15 minutes until golden brown. Allow to cool. Omega-6 fats are found in vegetable oils such as rapeseed, corn, sunflower, soybean and some nuts. Omega-3 fats are found in oily fish such as mackerel, kippers, herring, trout, sardines and wild salmon. To balance our intake of omegas we should aim to eat more omega-3s and significantly less omega-6s. Unfortunately, most people eat way more omega-6s than they do omega-3s - 10 to 25 times more - so although Smoked Mackerel Tartare helps redress the balance in favour of eating more omega-3s, not so much if you bind it together with mayo that’s loaded with omega-6s! Swapping processed vegetable oils for naturally low in omega-6 organic oils, such as olive or avocado, makes sense. The trouble is I find both olive and avocado oils too overpowering (strong and bitter) to make good mayonnaise and I don’t like using processed ‘mild’ olive oils either. This is where I invite you to say hello to Clearspring's Organic Sunflower Frying Oil. It is one of the few cold pressed oils that uses special sunflower seeds that are high in monounsaturated oleic acid (the sort found in olive oil) and low in omega-6. Irrespective of its name, this sunflower oil combined with olive oil makes a delicious, authentic-tasting, mayonnaise that’s so good I could stand on farmer’s markets and sell it! N.B. You will need a hand-held stick-blender to successfully make 3-Minute Mayonnaise. I’ve heard that professional chefs can always tell the calibre of a prospective new member of their brigade by getting them to cook scrambled eggs. Personally, I feel that putting together a nicely dressed bowl of fresh salad leaves might reveal a whole lot more. It’s no use pretending that lifeless, pre-washed salad leaves (often rinsed in a chlorine wash and then handled by multiple pairs of hands and preserved with a blast of gas before being bagged!) or the familiar shrink-wrapped iceberg lettuce is going to cut it, if you want to make a decent salad. Nothing compares to truly fresh salad leaves, so start with the freshest greens you can find, preferably organically grown. Find whole lettuce that has a ‘just-picked’ appearance such as romaine or little gem, or a head of leaves like soft, tender English lettuce or green, red, bronze oak leaf lettuce. Build your salad from there by adding a variety of other salad greens. Perhaps some mild tender mâche (lambs lettuce), rocket, bright peppery watercress (ideally bought by the bunch) or in winter, chicories. Add to these some young sweet ‘living’ leaves, pea shoots, fresh growing herbs or mustard and cress. Packed with essential nutrients and virtually carb-free, a generous daily portion of raw healthy salad greens is the most gratifying accompaniment to any meal. In my view, a perfect tossed green salad that’s well balanced and well dressed is also the hallmark of a great cook. This isn’t so much of a recipe with pre-determined ingredients as it is a general guide to salad making. Primarily let the season, what's looking at it’s best and what you fancy determine your choice. If you’re willing to shop and cook in a way that nourishes your body and satisfies your soul, the possibilities are endless! The only proviso is that for a tossed green salad, keep it simple - it really doesn’t need anything more than a well-balanced classic French Dressing. Alternatively, you can create your own ‘house’ salad by adding a riotous colour of different fruits and vegetables, together with your favourite dressing. The salad pictured here was a mixture of Romaine and Little Gem lettuce hearts, wafer thin slices of fennel, wild rocket, watercress, red and white Belgian chicories, thinly sliced red and yellow peppers, Sundream vine tomatoes, flat leaf parsley and avocado. First make the vinaigrette dressing. Mix the vinegar, sea salt, pepper, honey and mustard together in a medium sized bowl and give it a good whisk. Add the oil a small dash at a time, whisking well between each addition. Continue adding the oil until it is all amalgamated into vinaigrette. Check and adjust the seasoning if necessary (if it tastes a little tart, a single drop of liquid Stevia will help compensate). Remove the base of the stalk and any roots attached to your lettuce together with any tough, yellowing or damaged outside leaves. If the leaves are small, leave them whole. Larger leaves should be torn along their central rib into bite-sized pieces. Remove any thick stalks from the likes of fresh watercress or spinach. Many leafy salad greens are grown in sandy soil so to avoid grit ending up in your salad, you’ll need to wash them well. Fill a sink or large soaking bowl full of cold water then gently submerge and swish the leaves around in the water to dislodge any dirt. Handle your leaves lightly, if they get bent small cracks on the surface will cause them to wilt. When lifting them out of the sink or soaking bowl, don’t just grab them. Spread your hands out underneath the leaves in the water and gently lift them out using your loosely splayed fingers to support them. Lay them out on a clean tea towel and gently pat dry with paper towels. A salad spinner makes light work of washing and drying. I bought the older model of the iconic OXO Good Grips salad spinner several years ago and it’s an invaluable kitchen-aid that spin dries salad leaves and herbs in seconds without bruising them. First, fill the bowl of the spinner with cold water and submerge the leaves in the spinner basket into the water. Gently swish around in the water to allow any sand to drop through the basket into the bottom of the bowl. Repeat several times with fresh clean water until there’s no sand left in the bottom of the bowl. Pour away the last batch of water then simply put spinner lid on and pump several times to dry. Don’t go mad with the spinning action or you might crush the leaves. Just give it a couple of good spins, then rearrange the leaves, drain the bowl and spin again. Don’t over-fill the spinner basket either, it’s best to spin the leaves in batches rather than cram too much in. Arrange the dry leaves prettily in a bowl (much larger than you think you need if you intend to dress your salad) together with any other salad ingredients you’re using Cover and keep chilled until you’re ready to serve. Just before you want to serve your salad, add a few tablespoons of your chosen dressing to the bowl then gently turn the salad over and around with your hands (you can use a couple of large spoons, if you prefer) until everything is evenly and lightly coated in the dressing. Serve immediately. Don't overdo the dressing on your salad. You want just enough vinaigrette to lightly and evenly coat the leaves rather than drown them out - too much dressing will simply make them go unpleasantly soggy. My first awakening to Chèvre Blanc goat’s cheeses’ melting, bubbly, golden goodness dates back to the early 1990’s, when we discovered a brilliant bustling French brasserie in Covent Garden called Le Palais Du Jardin (now closed). At the time, they served a salad of this fresh-tasting meltingly soft cheese with slices of poached pear and a balsamic dressing. The lively tang of goat's cheese served hot from the grill works equally well here with the earthy sweetness of beetroot, the peppery freshness of rocket (or watercress) and the piquancy of a simple vinaigrette. The whole dish coming together to great effect with the addition of some freshly chopped chives. I really like the contrast between the warm richness of cheese and cool vegetables. The pink beetroot makes this salad as pretty as it is inviting. Since the 90’s, toasted goat’s cheese has become an enduring favourite for both vegetarians and non-vegetarians alike. We had it today for a light lunch, but I also like to serve it as a starter to impress hungry dinner guests, which it always does! First make the vinaigrette dressing. Mix the vinegar, sea salt, pepper, honey and mustard together in a medium sized bowl and give it a good whisk. Add the oil a small dash at a time, whisking well between each addition. Continue adding the oil until it is all amalgamated into vinaigrette. Check and adjust the seasoning if necessary (if it tastes a little tart, a single drop of liquid Stevia will help compensate). Alternatively, make my Fast & Easy Vinaigrette and shake in a lidded container. Set aside 6 tablespoons of the vinaigrette dressing until you’re ready to serve the salad. Thinly slice the beetroot (a mandoline slicer gives the quickest and neatest result). Lay the beetroot slices so they overlap each other to form a circle in the centre of four plates. Drizzle a teaspoon of vinaigrette over each beetroot circle - keeping the plate clean. Line a baking tray or your wire grill rack with some non-stick foil. Place the goats' cheese rounds onto a baking sheet and place under the grill (about 3-4 inches from the heat) for 4-5 minutes, or until the cheese has melted and turning golden brown. Whilst the goat’s cheese is grilling, lightly dress the rocket leaves in a tablespoon of vinaigrette in a medium bowl. Divide the dressed salad leaves between the four plates piling it up neatly on top of the beetroot. When the cheese is ready, place one in the middle of each plate on top of the dressed leaves. Add the chives to the remainder of the dressing and drizzle around the outside of each plate. For this recipe, you require slices of Chèvre Blanc goat’s cheese about 2.5 - 3cm thickness, rind-on, cut from a log. Keep the goat’s cheese rounds refrigerated in their original wrapping until you’re ready to grill them. You do not want them to disintegrate into a messy ‘pool’ before they’ve had chance to brown! I’ve used the classic 3 parts oil to 1 part vinegar for this vinaigrette but you can adjust amounts according to your taste. If the finished vinaigrette tastes too tart, try adding more oil (or a drop of liquid Stevia); if it tastes too greasy, add a little more vinegar (or lemon juice). As an alternative to hand-whisked french dressing, make a vinaigrette by putting all the ingredients into a lidded jar and then shake the whole lot vigorously together until they’re combined, adding the chives afterwards. See my recipe for Fast & Easy Vinaigrette. Store the unused vinaigrette in a lidded container for future use. It will happily keep at room temperature for several days without spoiling, although it will eventually separate - in this case, just re-whisk or give it a good shake before using.